WATERLOO – When first-year Spanish 100 students at Wilfrid Laurier University were told they would be creating an illustrated children’s book by the end of the year in Spanish – a language they were just starting to learn – they were intimidated by the prospect. However, the project had a surprising twist; their 25 books would be donated to an underprivileged preschool in Mexico for children to read and enjoy. 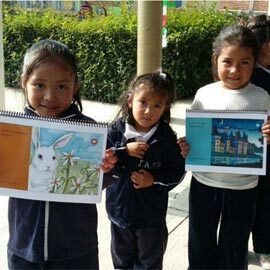 María Eugenia de Luna, assistant professor in Laurier’s Languages and Literatures program and instructor of the course, knew that once her students realized the importance of these books for the children from the Jardín de Niños José Ángeles, they would be excited by the project. The 49 first-year students teamed up in pairs and used a digital literacy tool to select images and format their stories into a book. The project was challenging – the story had to be fit for children aged one to four and had to correlate with the images available in the program. In November last year the preschool students lined up to receive the books and thank the Laurier students for writing stories just for them. The 25 books made a sizable addition to the limited library at the school. Creating engaging projects, such as a storybook, gives students learning a new language an extra boost to overcome steep learning curves, says de Luna. It also makes students realize how they can make a big impact through their education.